Joe and Emily met at a tattoo parlor a few years ago and their love story has culminated in a Star Wars engagement ring. Nothing could make us happier. Joe teamed with Paul Bieker of Paul Michael Design to come up with the perfect ring for his lady. Click through our gallery to see the project go from concept to the actual popping of the question, which, if you were wondering, happened on Halloween (hence the costumes). This entry was posted in Diamond rings, Engagement rings and tagged diamond, diamond engagement ring, diamond engagement rings, engagement, engagement ring, engagement rings, halloween, jeweler, love, love story, paul bieker, r2 d2, star wars on November 23, 2012 by Donald. Shopping for an engagement ring is a very exciting time in any relationship. Whether the groom-to-be is shopping alone or has taken along his bride-to-be, it is important that he be well informed about the wide variety of engagement rings available prior to making a purchase. Today, many young couples are purchasing vintage engagement rings. 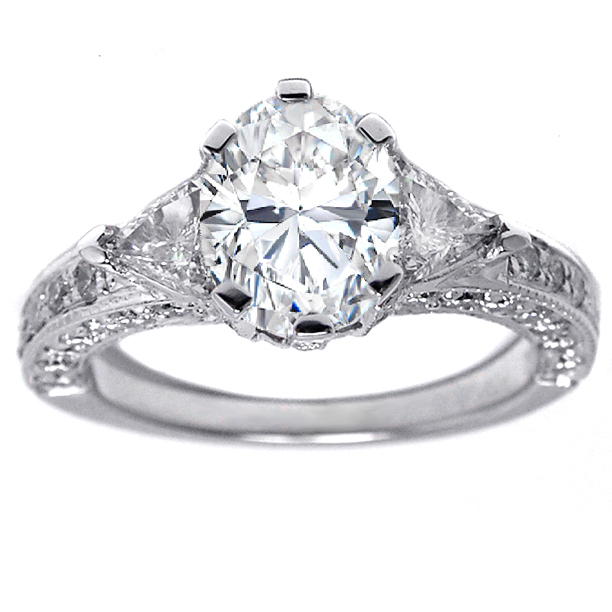 In recent years, antique and vintage engagement rings have become quite popular. When inquiring about estate or vintage engagement rings, realize that this category refers to anything less than fifty years old. It many even refer to a used ring that was bought only one year ago. When discussing a vintage engagement ring, the term “vintage” is often a term used as a catchall that really means “old ring”. Antique and vintage engagement rings are popular for many reasons; they are generally less expensive, well constructed, and once purchased they become an instant heirloom. These facts alone make the antique and vintage engagement rings an easy sell for most young couples that are just starting out and building a new future together. The idea of creating an heirloom for their future family increases the emotional value of the ring and the shopping experience. Currently, the art deco style of engagement rings, made during the 1920-30’s is the most popularly purchased vintage engagement ring. Antiques rings from this time period reflect the geometric fashion trend that was so popular during this time in history. It is not uncommon to find vintage engagement rings that copy this bold style because it is still a popular fashion choice today. The distinction between antique and vintage art deco rings is that the antique was made during that time period where as a vintage ring is more likely a copy of that fashion statement. When buying an antique or vintage engagement ring, always review any written description and gemologist reports thoroughly. Since antique and vintage engagement rings are often found in places such as estate sales, pawn shops, online auctions and antique stores and jewelers; you want to insure that you know all there is about any ring before you buy it. Make sure that the seller of the ring is able to provide you with a detailed description of the vintage engagement ring including the 4-C’s of jewelry: color, cut, carat and clarity. These aspects of the ring need to be clearly addressed in the written document. It is also very important that the age of the ring, ring size, and current condition of the ring be mentioned in any written document. If it is at all possible, obtain a copy of the gemologist report as well. Prior to payment, it is a good idea to establish what type of return policy the seller offers in case a problem should materialize with the ring. You want to make sure that your purchase is covered financially. As you begin to shop for your engagement ring, remember that this is a very important symbol of your love and marriage vows. So, purchase the ring you fall in love with but be intelligent about the business aspect about the sale. Hopefully, this is the one ring you will wear for the rest of your life; make sure it will stand the test of time. This entry was posted in Antique engagement rings, Diamond rings, Engagement rings, Vintage engagement rings and tagged Antique Engagement Rings, Antiques, engagement ring, fashion statement, fashion trend, love, vintage art, vintage diamond rings, vintage engagement ring on October 27, 2012 by Donald.